Building your own fitness equipment is not only rewarding, it also opens up a world of possibilities not normally available with mass produced off-the-shelf home gym equipment. There are many simple DIY projects the home builder can undertake, from making your own weights to building a power rack – but this is the only place where you’ll will find all the information you need to build a Home Gym Bed™. Q. What’s a Home Gym Bed™? A. A Home Gym Bed™ is a king size bed that transforms into a multi gym comprising of a Smith machine and cable pulley exercise machine. Designed for small spaces, apartments and flats, or for anyone who just hasn’t got the room for large conventional home gym equipment. If you’re experienced in DIY fabrication and are looking for the ultimate homemade gym equipment project then the Home Gym Bed™ is definitely something to consider. The comprehensive step by step build manual and build videos will guide you through the construction process of the Home Gym Bed™ one stage at a time. 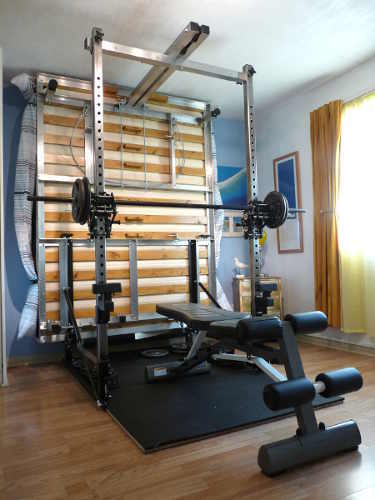 The two short videos below show the construction of the self spotting (Smith machine) and cable pulley system for the Home Gym Bed™. The full length videos can be seen in HGB build information area. How to be mentally strong – don’t let circumstances control you!